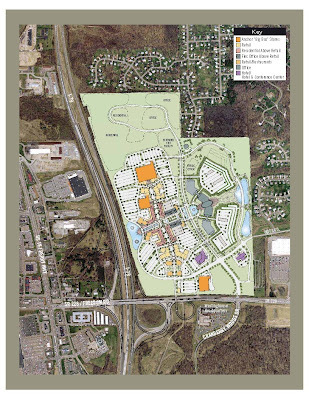 An ongoing story that has developed over the past three years and well covered by the Pittsburgh Business Times's Tim Schooley and Ben Semmes concerns multiple retail and office projects planned for the Cranberry Twp, PA area near the intersection of I-79 and state route 228. On the planning block for three years, the cornerstone project involves Simon Properties, owner of Ross Park Mall, South Hills Village and Century Three Mall, as well as dozens of other properties around the country. This would be a retail project of over 850,000 square feet similar in design to Pittsburgh’s Waterfront in West Homestead. With a total projected cost of over 85 million dollars, Simon has put together financing of 40 million along with an additional 25 million from state and local sources, leaving a shortfall of 20 million needed to break ground. A large part of the funding would go toward road improvements needed to both Rt. 228 and to the I-79-Rt 228 interchange to handle projected traffic volumes created by the projects. A project of this scope, as accessible as it would be, do to it’s location near I-79, I-76 (PA Turnpike), state Rt. 19 and state Rt. 228, would make it a destination for shoppers from a 50 mile radius and more. The number of good jobs created would be over a thousand not counting the additional support and ancillary jobs. Click on the image for a larger view. It would be more than a shame if this project were to die because this funding gap could not be closed by the unofficial deadline of the end of 2008. Simon Properties has inferred that if no real progress is made by then they will walk away and look elsewhere for investment opportunities. It’s time our state and federal representatives step up and help close this gap. Opportunities like this are extremely rare. The benefits we would get are regional in scope. Our elected leaders have an opportunity here to show the leadership they were elected to provide. Or they can do nothing. With an additional tax for a limited time (say a one % tax on purchases for the next ten years) given to Simon should help make up part of the lack of funding. Crnaberry is growing by leaps and bounds and is THE place to live. Many people moving into WPA are choosing that area to relocate and live. There will be more than enough people to support the retail and restaurants. If Cranberry/Pittsburgh cannot work this out, than I'd say Pittsburgh will never recover because this is a fundamental reason people are choosing to live up north. IT'S NEW! NEW AND CLEAN IS GOOD. Please don't let us down Pittsburgh and Cranberry (Township) please keep the steady stream of newcomers coming. If you back down on this, it will have a ripple effect I'm afraid WPA will not be able to recover from. People want to stay in WPA, but the lure of new, clean and convenient locations is very tempting.